Precast, prestressed concrete adjacent box beams are widely used in short- and medium-span bridges in the United States. However, a recurring issue with this type of bridge is the deterioration of shear key connections resulting in substandard performance of the overall bridge system. This research used full-scale structural tests to investigate four different shear key connection designs, including partial- and full-depth connections constructed with either conventional non-shrink grout or ultra-high performance concrete (UHPC). Quantitative measures to assist in evaluating the connection performance are suggested in the study. Parameters for the connection design were developed using the shear and tensile stresses in the connection. The behaviors of the connections using conventional grout and UHPC are presented. It was found that UHPC connections can be a resilient and innovative solution to prevent connection degradation in adjacent box beam superstructure systems, advancing the state of the practice in bridge construction. The testing program included multiple shear keys, test setups, and performance assessment tools, which are discussed in the following subsections. Four connections were evaluated in this study. The first two used conventional high-strength, non-shrink grout in tandem with transverse post-tensioning. The partial- and full-depth connections are shown in parts A and B in figure 1, respectively. The surface of the precast concrete in the connection had a sandblasted surface finish. The other two connections investigated were new design details that take advantage of the advanced mechanical and durability properties of UHPC, as shown in parts C and D in figure 1. These were also investigated as partial- and full-depth connections. The UHPC connections included an exposed aggregate surface finish on the precast concrete and reinforcing steel that extended from the precast box beams into the connection to form a non-contact lap splice. No transverse post-tensioning was included. The exposed aggregate surface preparation is emerging as a preferred surface finish for both UHPC and conventional grout applications. (10,11) The enhanced mechanical properties of UHPC allow for reduced embedment lengths for embedded deformed reinforcement, which simplifies the design and construction. An embedment length of only 5.5 inches (140 mm) for the No. 4 (i.e., M13) bars used in these connections has been demonstrated to develop the yield strength of the bar. (12) The dimensions of the connections are presented in figure 2. Figure 1. Shear key connection designs used in the study. The conventional grouting material used in this study was a portland cement-based, prepackaged, non-shrink grout. It reached an average compressive strength of 7,800 to 8,120 psi (54 to 56 MPa) at the time of testing. The UHPC used is a commonly available prepackaged product with a steel fiber content of 2 percent by volume and an average compressive strength of 26 ksi (179 MPa) at the time of testing. The test setup included thermal loading, cyclic structural loading, and transverse post-tensioning, which are all described further in the following subsections. Thermal loading was simulated by pumping steam through copper tubes cast in the top flange of each box beam. A temperature gradient between the top and bottom flanges of approximately 50 °F (28 °C) was created. A total of 10 thermal cycles were applied to each test specimen, and visual inspection was conducted. Figure 2. Connection design of the partial- and full-depth beams. The cyclic structural loading was applied by four-point bending, as shown in figure 3. The loading was intentionally placed 6 inches (152 mm) off the centerline of the box beam to create a more severe torsional moment. This generated a greater transverse tensile force in the connection compared to centrically loading the beam. Figure 3. Cyclic structural loading configuration. Figure 4. Clamping at the end of beams used in partially and fully stiffened cases. Figure 5. Intermediate support on one beam used in the fully stiffened case. The transverse post-tensioning force used with the conventional connections varied. Post-tensioning levels of 8, 6, 4, 2, 0.8, and 0 kip/ft (117, 87, 58, 29, 12, and 0 kN/m) were tested. Figure 3 shows the transverse post-tensioning locations for the conventional grout connections. These connections received a small post-tensioning force prior to connection grouting with the full post-tensioning force being applied after the grout had gained strength. Transverse post-tensioning was not applied to the UHPC connections. To compare the connection performance and efficiency under different conditions, quantitative measurements are needed. Deteriorated connections can compromise both the strength and serviceability of bridges. 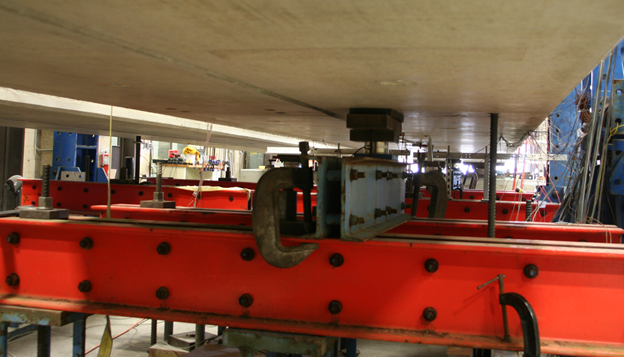 When the connection becomes cracked, the load distribution between the box beams is compromised, and the live load may remain concentrated in a few beams under the wheels. This can potentially exceed the allowable loads of the beams. Beams with failed connections will not deflect equally under live loads. Excessive differential displacements between adjacent girders may further degrade the connection and lead to reflective cracking in the overlay if one is present. Cracks can allow chloride-laden water to infiltrate the structure and can corrode the reinforcing bars and prestressing strands adjacent to the connection. This study adopted two parameters to measure the performance of the connection. The first was the moment distribution factor that evaluated the ability of the shear key to transfer loads; it relates to the strength condition of the bridge. The second was the differential deflection that measured the relative displacement between the adjacent beams and corresponds to the serviceability of the bridge. For the case of the fully stiffened support condition used in this study, the moment distribution could not be calculated using the ratio of carried moments because the boundary conditions on the two beams were different. In this case, the equivalent moment transferred through the shear key was used. This method calculated the moment using the additional strain in the beams rather than the recorded strain at the maximum load. This measure of moment approximated the amount of moment transferred through the shear key from the loaded beam to the unloaded beam. With the pre-wetting and curing procedures adopted in this study, the four connections investigated were constructed successfully in the laboratory. Each test specimen was first thermally loaded and then structurally loaded. Note that the full-depth conventionally grouted connection cracked upon release of the small post-tensioning force that was used to stabilize the specimen during grout casting. This was likely due to differential sweep in the beams. Each beam was thermally loaded to create a temperature gradient between the flanges of approximately 50 °F (28 °C) for 10 cycles. The thermal loading generated an upward deflection at the mid-span of 0.425 to 0.570 inch (10.8 to 14.5mm). The behavior of the beams used in the tests was generally the same. Visual inspection conducted during the thermal loading detected only minor, non-structural cracking in the partial-depth conventionally grouted connection. No debonding was caused by thermal loading for any of the connections. For the partial-depth conventional grout connection, nearly 7 million loading cycles were applied. The cyclic structural load was not observed to propagate the minor cracks formed during thermal loading or initiate any new cracks. The uncracked connection effectively transferred the load and limited differential deflection regardless of the level of transverse post-tensioning force. The partial-depth conventionally grouted connection was intentionally cracked by applying a direct tensile force to the connection, as shown in figure 6. The interface between the grout and concrete was the weak link in the conventionally grouted connection, as cracking occurred primarily at this interface. Mechanical cracking of the connection ceased when about two-thirds of the connection was cracked. The partially cracked connection was then cyclically loaded and performed similarly to the uncracked connection in terms of moment distribution and exhibited a slight increase in differential deflections. The crack propagated as loading cycles progressed. Differential deflection and crack propagation increased as the level of transverse post-tensioning decreased. When the connection was mechanically cracked so the full length of the connection was cracked, the same observations were made. The distribution of longitudinal strains was not substantially affected, and differential displacements were seen to slightly increase, particularly when little to no post-tensioning was applied. The loadings imparted were not sufficient to significantly degrade the shear interlock across the cracked connection. Moving loads and/or water ingress combined with freezing temperatures, neither of which were applied in this study, would likely serve to widen cracks and commensurately decrease the ability of beams to share loads across connections. Figure 6. Mechanical cracking of the partial-depth conventionally grouted connection, including cracking setup and cracked connection. The full-depth conventionally grouted connection was intact after casting and curing but cracked when the post-tensioning force was removed. When the cracked full-depth conventionally grouted connection was cyclically loaded, similar observations to those for cracked partial-depth connection were observed. Both the partial- and full-depth UHPC connections performed well. No cracks were observed during either the thermal loading or the structural loading cycles. 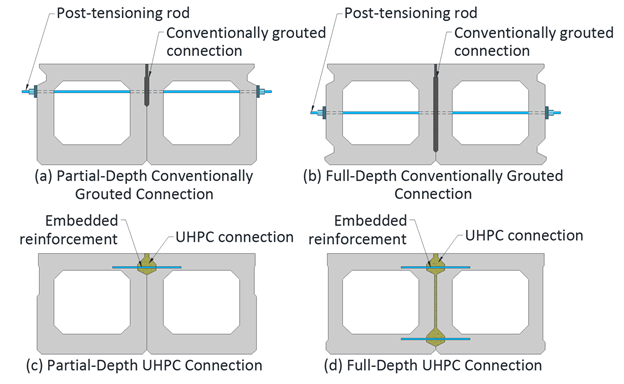 The UHPC connections performed similarly to the uncracked conventionally grouted connections in terms of longitudinal strain, moment distribution, and differential deflection. When a direct tensile force was applied to the UHPC connections to intentionally crack the connection, the box beam concrete cracked instead of the connection interface or the UHPC. This indicates that the interface bond between the UHPC and concrete with exposed aggregate surface preparation was significantly enhanced. This was also observed in a study by De la Varga et al., where interface bond strength of different grout materials with concrete was investigated. (14) They found that for connections between UHPC and concrete with an exposed aggregate surface finish, failure is likely to occur in the concrete instead of at the interface or in UHPC. This is not true for conventionally grouted connections, as failure often occurs in the interface. Three parameters are considered important in the design of connections: transverse post-tensioning force, transverse shear strength of the connection, and the transverse tension at the connection (i.e., in the grout and at the interfaces) between the grout and box beam concrete. The effect of transverse post-tensioning force was evaluated in this study by comparing the moment distribution and differential deflection between the two beams under different levels of transverse post-tensioning force. It was found that the partial-depth conventionally grouted uncracked connection could effectively distribute the moment and limit the differential deflection independent of the level of transverse post-tensioning force applied. The differential deflection was nearly constant and kept at a low value of approximately 0.0025 inch (0.064 mm). When the connection became partially or fully cracked, the level of post-tension had a more pronounced effect on the differential displacement. As cracks developed in the connection, differential displacements quickly increased and led to further damage. Differential displacements grew to as high as 0.012 and 0.019 inch (0.305 and 0.483 mm), respectively, in the fully cracked partial-depth connection and partially cracked full-depth connection with no post-tensioning force. A fully functioning connection should transfer the load from one beam to the other, and the two beams are expected to have the same deflections. The Precast Prestressed Concrete Bridge Design Manual states that the acceptable amount of differential deflection between adjacent box beams is 0.020 inch (0.508 mm) for spans up to 100ft (30.5 m). (6) The forces being transferred through the connection drive the unloaded beam to have the same deflection. The Canadian Standards Association code assumes that the load is transferred from one beam to another primarily through transverse shear; transverse flexural rigidity is neglected. (16) The present study used the same assumption. When two beams are connected and only one beam is loaded, the magnitude of the transverse shear force generated in the connection is related the deflection of the beams. At locations where there is no potential deflection, such as at the supports, no transverse shear force is generated. One possible transverse shear distribution is presented in figure 7 where Vy is the shear force per unit length. If the shear distribution and the moment transferred through the shear key are known, the shear force transferred through the connection can be calculated. As the variable of interest for design is the maximum shear force in the connection, the shear force calculation can be simplified by assuming a triangular shear force distribution, V'y, in figure 7. The maximum distributed shear force, v'max, of V'y should be larger than the maximum value of Vy. v'max can be calculated using the equation in figure 8, where Mmax is the maximum moment transferred through the connection and is the span length. Figure 7. Transverse shear force distribution through the connection. The most severe loading case evaluated in the study had the fully stiffened boundary condition loaded under the 90-kip (400-kN) loading range. In this case, Mmax was calculated to be 498kip-ft (673 kN-m). (13) The equation in figure 8 calculates v'max as 216 lb/inch (37.8 kN/m) for this case. For the partial-depth conventional grout shear key in this study, the connection was 8.875 inches (225 mm) deep, resulting in a shear stress of 24.3 psi (168 kPa). Figure 8. Maximum shear distribution through the connection. The interface shear strength of the conventional grout with the precast concrete has been reported by other researchers. For example, a study by Buyukozturk et al. found that the shear strength at the interface between the grout and concrete for a flat joint was 85 psi (590kPa) under 100 psi (690 kPa) of confining pressure and increased to 210 psi (1.4 MPa) with 300 psi (2.07MPa) of confining pressure. (15) They also found that the shear strength of a keyed joint would be 10 times greater than a flat joint under the same confining pressure. Another study found that the shear strength for keyed joints in the absence of transverse confinement can range from 150 to 358 psi (1.03 to 2.47 MPa). (18) Based on these values, the shear strength of a conventionally grouted connection is sufficient to transfer the estimated shear stress calculated in this study. The Canadian Standards Association provides charts to determine the transverse required shear force to be resisted based on the study by Bakht et al. (16,17) Using this chart, the maximum transverse shear force due to an AASHTO HS-20 truck is calculated to be approximately 207 lb/inch (36.3 kN/m) for the beams tested in this study. (3) This assumed the minimum bridge width available in the charts, which is 25 ft (7.6m). (16) While the estimated shear distribution measured in this study was low, the transverse shear force due to an AASHTO HS-20 vehicle can be as high as 1,300 lb/inch (228kN/m). (3,15) The typical partial-depth shear key can be assumed to have a depth of about 8 inches (203 mm). (2) This would result in a minimum suggested connection shear strength of 160 psi (1.1 MPa). The connection mainly transfers the load from one beam to another through transverse shear, which drives adjacent beams to have the same deflection. The connection needs to provide transverse flexural rigidity to resist transverse tensile forces due to eccentric loads. This study intentionally placed the loading 6 inches (152 mm) off the centerline of the beams to induce more transverse tensile stress. The transverse strain in the connection was recorded. The transverse tensile strain generated by the loading was observed to be less than 40microstrain. This transverse tensile strain must be transferred by the connection, so the interface bond between the grout and box beam concrete should have sufficient strength to resist this strain. A 40-microstrain deformation in a 6,000-psi (41-MPa) concrete would be expected to produce a stress of approximately 150 psi (1 MPa). Early age dimensional stability of the grout is also important, as shrinkage strains can be large, resulting in cracking and interface debonding. When the connections were placed under direct tensile load, the conventional non-shrink grout connections cracked at the interface between the grout and concrete, while the UHPC connections cracked in the concrete beam. Selection of a precast concrete surface preparation, grout, and curing methodology can ensure that the tensile resistance of the connection is at least as strong as the tensile resistance of the precast concrete. This can be beneficial in mitigating interface cracking. Full-scale testing on four adjacent box-beam connection designs was conducted. These included partial- and full-depth conventional non-shrink grout and UHPC connections. The beams were subjected to thermal and cyclical structural loading. The main findings, conclusions, and recommendations are provided in the following subsections. The thermal loading generated in the study produced a temperature gradient between the top and bottom flanges of approximately 50 °F (28 °C) and resulted in an upward deflection of approximately 0.47 inch (11 mm). The applied thermal loading cycles did not initiate any penetrating cracks in the connections. The cyclic structural loading applied in this study was severe. The most extreme case in this study utilized a maximum loading range of 90 kip (400 kN) with a 5-kip (22-kN) minimum load. Within the most restrained test setup, this created an equivalent moment of 498 kip-ft (673 kN-m) transferred through the connection. When a connection was uncracked, cyclic structural loading was not seen to initiate cracking. This was true regardless of the level of post-tensioning in conventionally grouted connections. The calculated shear forces transferred through the connection in this study were small. Maximum shear stress in the partial-depth beams was 23 psi (161 kPa). When there were preexisting cracks in conventionally grouted connections, cyclic structural loading was observed to propagate the cracks independent of the level of transverse post-tensioning force applied. Cracks propagated more quickly under lower levels of post-tensioning. With higher levels of transverse post-tensioning force, the cracked connection could still effectively transfer the load, though differential deflections increased. When the transverse post-tensioning force was removed, the cracked connection could quickly lose its ability to limit differential deflection; this could reduce its capability to effectively transfer the applied loads between adjacent beams. If the transverse post-tensioning force was applied before casting the grout, the loss of the post-tensioning force after casting may cause transverse tensile forces to develop in the connection. This could lead to cracking if the beams exhibited a large enough amount of relative sweep in their as-fabricated shape. When the connection was uncracked, beams with conventional grout connections had similar load distribution performance as beams with UHPC connections. However, the interface between the conventional grout and box beam concrete was the weak link of the system and could crack if a sufficient load or deformation occurs. The behavior of the adjacent box-beam bridges with UHPC connections could be expected to be comparable with an equivalent structural system with no field-cast connections. The mechanical capacity of the UHPC connection was observed to enhance connection capacity so that under the application of large transverse tensile stresses, tensile rupture occurred in the precast concrete box beams. Full-depth connections showed slight improvements in load distribution between beams. This was likely due to the increased depth of the connection, which significantly increased the transverse flexural and shear stiffnesses of the connection. However, increasing the depth of the connection increased construction costs and possibly construction complexity. A partial-depth UHPC connection appeared to deliver good performance, including elastic distribution of loads across the connection without cracking of the connection. The performance and efficiency of the shear key can be evaluated for load transfer by determining the moment distribution between beams. The concept of “equivalent moment,” which calculates the moment transferred through the connection from a loaded beam to adjacent beams, can be used to compare the test results from this study with other bridge designs that have different geometries and loading conditions. 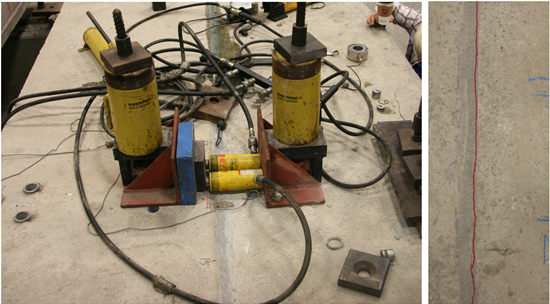 Transverse post-tensioning can limit differential movement between beams, compensate for some transverse tensile strains across the connections, and assist with load transfer between beams after connection cracking. Increased transverse post-tensioning force distribution along the length of the connections could enhance system performance as the keyway shear strength increases with more confinement force. However, as commonly deployed today, transverse post-tensioning only effectively confines a small area near the post-tensioning locations. This transverse post-tensioning would likely be most valuable after connection degradation has already begun, thus serving to limit large differential deflections between adjacent beams. Based on the concurrent research by De la Varga et al., a minimum interface bond strength of 150 psi (1.0 MPa) is recommended when selecting a grout material. (14) This will help to avoid interface cracking due to eccentrically placed external loads. The possible transverse tensile forces and deformations due to thermal loads and material shrinkage are not included here. Yuan, J., Graybeal, B., and Zmetra, K. (In press). 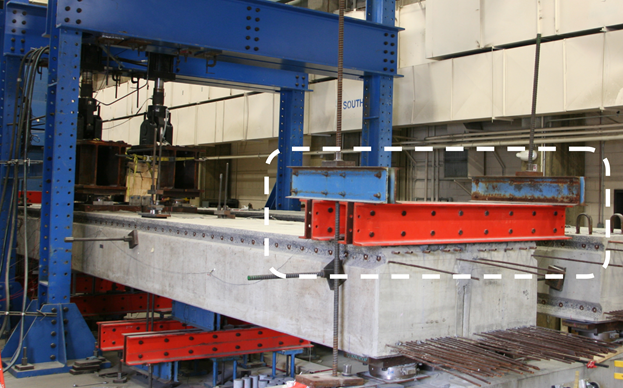 Box Beam Bridges: Testing of Conventional Grout and Ultra-High Performance Concrete Connection Details, Report No. FHWA-HRT-17-093, Federal Highway Administration, Washington, DC. Russell, H.G. (2011). “Adjacent Precast Concrete Box-Beam Bridges: State of the Practice,” PCI Journal , 56 (1), pp. 75–91, Precast/Prestressed Concrete Institute, Chicago, IL. AASHTO. (2002). Standard Specifications for Highway Bridges, 17th Edition, American Association of State Highway and Transportation Officials, Washington, DC. AASHTO. (2013). AASHTO LRFD Bridge Design Specifications, Sixth Edition, American Association of State Highway and Transportation Officials, Washington, DC. AASHTO. (2010). AASHTO LRFD Bridge Construction Specifications, Third Edition, American Association of State Highway and Transportation Officials, Washington, DC. PCI Bridge Design Manual Steering Committee. (2011). Precast Prestressed Concrete Bridge Design Manual, Third Edition, Precast/Prestressed Concrete Institute, Chicago, IL. El-Remaily, A., Tadros, M.K., Yamane, T., and Krause, G. (1996). “Transverse Design and Adjacent Precast Prestressed Concrete Box Girder Bridge,” PCI Journal, 41 (4), pp. 96–113, Precast/Prestressed Concrete Institute, Chicago, IL. Hanna, K.E., Morcous, G., and Tadros, M.K. (2007). Transverse Design and Detailing of Adjacent Box Beam Bridges, Proceedings of the 2007 Precast/Prestressed Concrete Institute National Concrete Bridge Conference, Phoenix, AZ. Yuan, J. and Graybeal, B. (2016). “Full-Scale Testing Of Shear Key Details For Precast Concrete Box-Beam Bridges,” Journal of Bridge Engineering, 21 (9), pp. 14, American Society of Civil Engineers, Reston, VA.
Graybeal, B. (2011). “Fatigue Response in Bridge Deck Connection Composed of Field-Cast Ultra-High Performance Concrete,” Transportation Research Record 2251, pp. 93–100, Transportation Research Board, Washington, DC. Graybeal, B. (2014). Design and Construction of Field-Cast UHPC Connections, Report No. FHWA-HRT-14-084, Federal Highway Administration, Washington, DC. Yuan, J. and Graybeal, B. (2014). Bond Behavior of Reinforcing Steel in Ultra-High Performance Concrete, Report No. FHWA-HRT-14-089, Federal Highway Administration, Washington, DC. Yuan, J. and Graybeal, B. (2014). Adjacent Box Beam Connections, Proceedings of the 2014 Precast/Prestressed Concrete Institute National Bridge Conference, Washington, DC. De la Varga, I., Haber, Z.B., and Graybeal, B.A. (2016). Performance of Grouted Connections for Prefabricated Bridge Elements—Part I: Material-Level Investigation on Shrinkage and Bond, Proceedings of the 2016 Precast/Prestressed Concrete Institute National Bridge Conference, Nashville, TN. Buyukozturk, O., Bakhoum, M.M., and Beattie, M. (1990). “Shear Behavior of Joints in Precast Concrete Segmental Bridges,” Journal of Structural Engineering, 116 (12), pp. 3,380–3,401, American Society of Civil Engineers, Reston, VA.
Canadian Standards Association. (2000). Design of Highway Bridges, CSA S6-00, Rexdale, ON. Bakht, B., Jaeger, L.G., and Cheung, M.S. (1983). “Transverse Shear in Multibeam Bridge,” Journal of Structural Engineering, 109 (4), pp. 936–949, American Society of Civil Engineers, Reston, VA.
Gulyas, R.J., Wirthlin, G.J., and Champa, J.T. (1995). “Evaluation of Keyway Grout Test Methods for Precast Concrete Bridges,” PCI Journal, 40 (1) , pp. 44–57, Precast/Prestressed Concrete Institute, Chicago, IL. Researchers—This study was led by Ben Graybeal at FHWA’s Turner-Fairbank Highway Research Center. It was executed by laboratory support contract staff members through contract DTFH61-10-D-00017. Additional information can be obtained by contacting Ben at (202) 493-3122 or in the FHWA Office of Infrastructure Research and Development located at 6300 Georgetown Pike, McLean, VA 22101. Distribution—The TechBrief is being distributed according to a standard distribution. Direct distribution is being made to the Divisions and Resource Center. Key Words—Adjacent box beam, Field-cast connections, Conventional grout, Ultra-high performance concrete, Transverse post-tensioning, Shear key. Notice—This document is disseminated under the sponsorship of the U.S. Department of Transportation in the interest of information exchange. The U.S. Government assumes no liability for the use of the information contained in this document. The U.S. Government does not endorse products or manufacturers. Trademarks or manufacturers’ names appear in this report only because they are considered essential to the objectives of the document.